Meade, KS – Artesian Valley Health System is pleased to announce the receipt of grants from the Community Foundation of Southwest Kansas. Artesian Valley Health System (AVHS) is a local nonprofit organization in Meade, KS. AVHS provides a wide range of care services through Meade District Hospital, Meade and Plains Rural Health Clinics, and at Lone Tree Retirement Center. Meade District Hospital is committed to provide the best possible pediatric health care in a comfortable environment. Providing health care for children is unique and different from that of adults. Medical equipment and supplies must be tailored to their young and small bodies for optimal treatments and results. In order to provide the best pediatric care possible, they are raising money to purchase pediatric equipment and supplies which total $21,000. 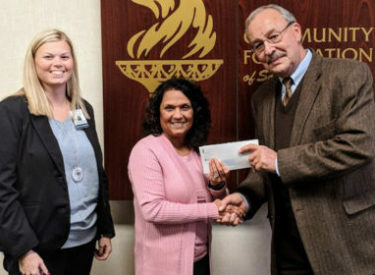 They are happy to announce receipt of a $16,000 grant from The Arthur and Cornelia Scroggins Foundation Fund at the Community Foundation of Southwest Kansas to apply towards their pediatric care project. Grants from the Community Foundation of Southwest Kansas are made available to charitable organizations in Southwest Kansas. In particular, the Scroggins Foundation Fund is awarded to programs and projects focused on serving youth. The hospital is also hosting an online fundraiser and planning a fundraising event in the Spring to raise the remainder of the project total. Plains Rural Health Clinic provides a convenient location for primary care services to patients of all ages. The clinic serves a lot of patients and requires facility upgrades to meet standards. They are happy to announce receipt of a grant from the Community Foundation of Southwest Kansas as well as a matching grant from the Plains Community Foundation Fund. Both grants total $6,516. Upgrades are already underway and an open house is being planned in April for patients and community members to see the completed updates. If you would like to donate to these projects, please make checks payable to Artesian Valley Health System, include the project name in the memo and mail to: Artesian Valley Health System; Attention: Stephanie Saucedo, CFO; P.O. Box 820; Meade, KS 67864.